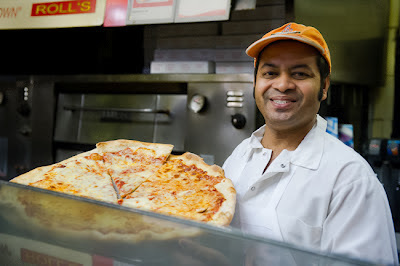 Sorry donuts, but my NY pizza was so freaking awesome it deserves a whole entire post. 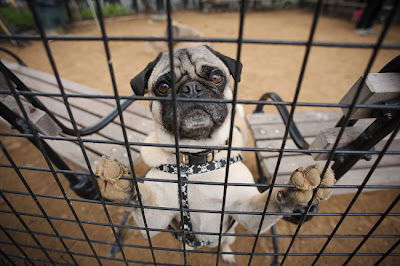 Especially since I spent most of my day in NY trapped in the pug zoo. Getting humped. In the rain. But more on that later. Right now I want to talk pizza. The plan was to eat pizza at some dude named Ray's place before heading back home to NJ. That was before the humans were cold and wet and tired. I guess cold wet tired humans don't care whose pizza they eat, so on the way back to the car we stopped at some dude named Ben's instead. Ben is very cool. When he saw my human taking pictures, he supermodeled with a pizza. 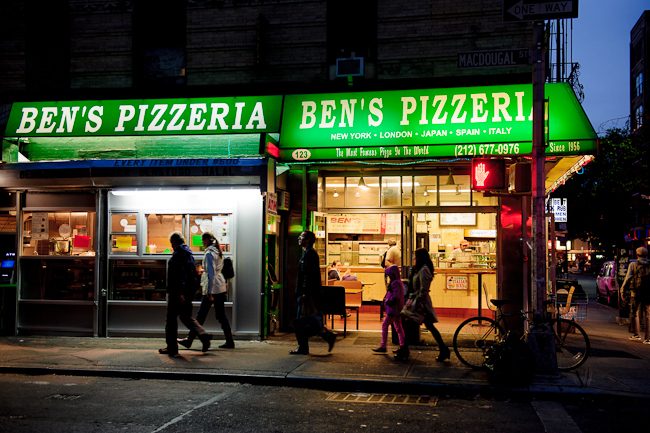 And when my human ordered me a slice of plain cheese pizza, Ben gave me a supertasty meaty thing called a pepperoni. Dogs like the pepperoni, Ben said. He was so right. The humans got to snarf their pizza down right their at Ben's, but I had to wait until we got back to NJ. Do you know how far NJ is from Ben's?? An eternity. Luckily cold NY pizza is still ridiculously tasty or we'd have to go back and get some more. My human says I'm getting uber-tubey so I only got half a slice of Ben's for dinner. Half a slice of Ben's is still bigger than my head, so I guess that's ok. The Eat Coast has so much tastiness, I don't want to get stuck eating carrots for the rest of our trip. Besides, Sophie says the Petsmart here has a scale and I don't want to break it. Oh my pug...this just made my day. Bouncer and chaos love pizza, especially the crust and let's not bring up pepperoni or pug-peroni as it's called in our house!!! PUG!! We loved getting to meet you! You are just as cool as we imagined! Bailey says he is sorry he tried to hump you yesterday - he has never seen a celebrity and kinda panicked. Anyway, we also loved getting to meet Sophie and your human's mom. She is so nice! If you could come visit me someday I promise never to let Sam hump you...I actually have never done that once in my life....we have super good pizza here also at the greek rest. where dad works.....and fudge places...and cup and cakes that sells donuts..are you sure you can't stop by for a visit? 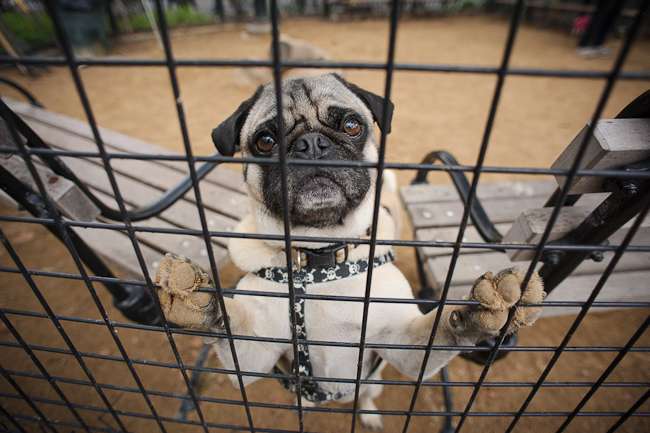 Pug, you are just such a superstar and so good looking, that pugs want to hump you! Scarlet did. Frank does. And we all know Bellatrix likes your backfat. And you handle it with such grace and style and we think you deserve all the pizza you can get your paws on. Puglet you lucky DOG! I mean first bacon FUDGE and now PIZZA! And a piece of pepperoni???? I don't even know what pepperoni is BUT I trust you when you say it is yummy. Tell your human, Amanda, that the action shots of you and your pizza are AWESOME!!!! Worthy of an ad campaign somewhere. I think replacing a DONUT story with a PIZZA story was a stroke of genius as I don't really like DONUTS. Keep having fun but LAYOFF the treats. In no way do I want your FOODABLE adventures to END. Puglet, our momma says your dirty paws look edible in that first pic and she loves your poppin out peepers in the second! We love pizza night too and just ate some leftovers actually. Can't wait to hear about more eatables and adventures!!! I used to eat Ben's pizza all the time when I was living across the street! Mmm, that pizza was sooooo good. 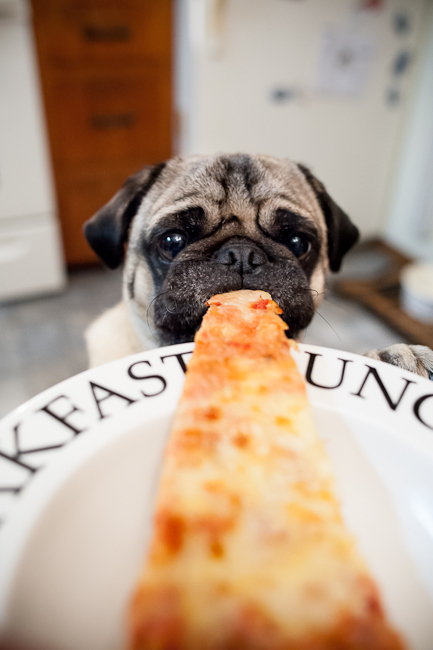 Puglet, you are too cute in these pizza eating photos! Pizza bliss! You are soooo lucky (and adorable) eating your pie. I only get the "pizza bones" (crust) around here. Keep us posted on your continuing culinary adventures. Puglet, I'm so glad you got your pizza! Ooh, and pepperoni! We loved meeting you and your human and Sophie and her human, too! 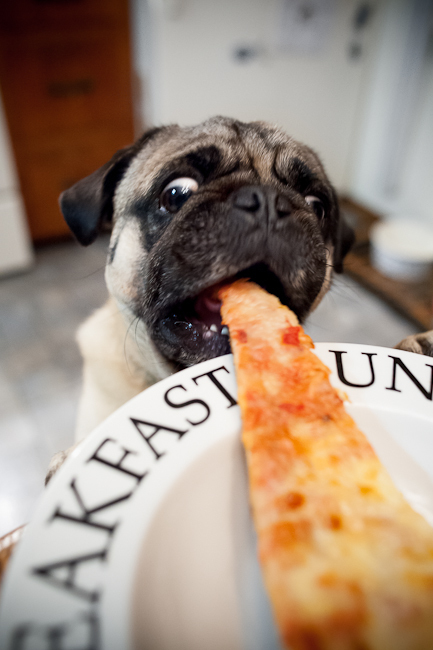 Ooooh Pug, that pizza looks GOOD! And you look like a supermodel eating it. Man, I love pizza! I get to eat it when the humans have it and I always look forward to that one last slice they save for me! Glad you got to have your slice, even if it was cut in half! I can't think of a luckier Pug in the whole wide world, than you, Puglet! Who else has a human that would share a WHOLE slice of pizza?! Oh Puglet, if you like Pizza you should come to Hoboken - we have a place that has the world's biggest slice - it's bigger than my cat brother! And it comes with bacon and pepperoni!! Love the second to last photo, it looks like you're throwing up a pizza! I wish that really happened, now I'm hungry! Pug, you aren't looking tubby at all. But those pics with you and the pizza was priceless! I'm not allowed to have pizza, but I love cheese. Your one lucky pug! Glad you got to chow down a slice of some good pizza! There's actually like tons of places in NYC called "Ray's" but they add things like "famous" or "the original" or even "Not" to the front of "Ray's" to differentiate each other. It's very confusing and I don't thing anyone really knows which is the REAL Ray's. I'd take pizza from ANYONE though - Ray, or Ben, or Steve, or WHOEVER! It was rad meeting you in the fur on Sunday. I still can't believe you were there. You had this amazing zen-like quality to you - I guess you were either still jet-lagged, or perhaps just exuding that coolness that comes from being such a pug celebrity. One other thing - Your human is super-cool, Puglet - she gave me a like a ZILLION baby carrots. I tried to go home with her but my 'rents wouldn't have it. I hope the rest of your stay in NYC is awesome! Non, nom photo is great! So cute! You are a rock star Puglet! We had so much fun meeting you, Miss Amanda, her mom and Sophie. We loved being supermodels for the day. We were shocked that your human got crazy Billie to pose for pictures. LOVE the pics of you eating the pizza!! You are one LUCKY pug!! After our visit with you on Sunday which I might add we (myself, my sister Ellie, and my sister Ruby )had a VERY nice time. It was a little cold and my drama queen sister Ruby was a little afraid of all the noises. We live in CT and it is nothing like NYC. However our humans took turns going into the pizzeria to eat there dinner while me and the gang stayed in the car the whole time. I have to admit we were kind of sleepy your MOM had us working REALLY hard for those treats but it was well worth it :) Sorry you couldn't go to Canada I am sure your Mom is missing you.